(Newser) – NASA officials didn't realize until after they had scheduled it that a Friday mission involving American astronauts Anne McClain and Christina Koch would be the first all-women spacewalk. But the milestone has now been called off because of a lack of medium-sized spacesuits, the New York Times reports. NASA said in a press release Monday that the assignment to install lithium-ion batteries for the International Space Station's energy system was adjusted because of spacesuit availability. There is only one medium-sized hard upper torso currently available, NASA said. Koch uses a medium, and while McClain thought she would work in a large size, she wore the medium during a spacewalk last week and discovered it fits her better. Based on just the article title, I initially thought it was because they'd synchronized. Why bother with anymore moon travel unless there is a good scientific reason to try a new trip. To turn space travel into a political correctness example seems like a nonsensical use of a huge amount of limited resources that could be used for deeper space studies of the unknown. Surely we all know that women can work together just fine. 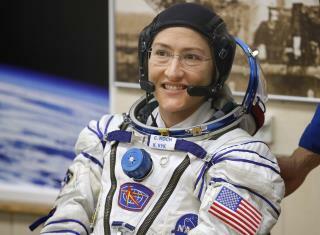 Do an all woman space walk without the suits...that would be a first. Otherwise, who gives a s­hit if two qualified individuals man or woman perform a space walk?